All too often, low-pressure waste steam and flash steam are simply released to atmosphere instead of being reused. This can be an unhealthy practice, since losing steam often means a loss of useable energy. TLV’s Steam Compressor uses high efficiency ejector technology to recover and reuse this excess steam, leading to lower energy consumption and fuel costs. Incorporating a steam compressor is often a great choice to increase efficiency by reducing the need to vent steam to atmosphere. reuses energy from excess steam by increasing it to useable pressure. features patented, highly efficient steam compression technology. can be purchased together with a condensate recovery package; condensate is first reduced to atmospheric pressure, causing it to flash into steam. The steam is then pressurized for reuse. features a pressure reducing valve with a built-in separator and steam trap, maintaining dry motive steam and ensuring long-term high efficiency. requires no electricity and is suitable for explosion-proof areas. Steam is often lost when high pressure condensate is collected in a boiler feed tank which is open to atmosphere. The sudden drop in pressure causes some of the condensate to flash into steam, resulting in energy being lost from the system. The cost of required pressure vessel inspections each year adds up to quite a sum of money. Since the steam compressor contains no pressure vessels, periodic inspections are not mandatory. A steam compressor can provide both of the benefits above and can be used in many different ways. The animation below is one example of a steam compressor incorporated into a steam system. The steam compressor recovers low-pressure steam leftover from various processes and pressurizes it by mixing it with high-pressure motive steam. The result is low/mid-pressure steam that can be reused in another process. 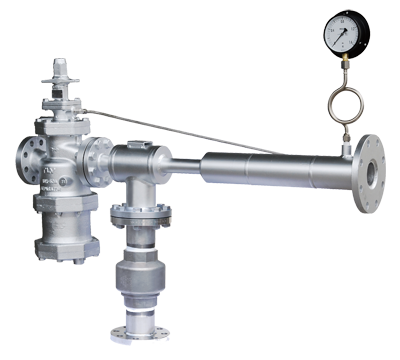 As high-pressure and low-pressure steam mix, the pressure reducing valve responds to fluctuations in secondary pressure and adjusts the valve opening accordingly, regulating the steam flow. Low pressure steam generated by applications such as power generation can also be recovered and reused.